I am not a gear junkie and product reviews are not something I plan on including on Hikemtshasta.com. I am, however, a map fiend and I enjoy studying maps whenever possible. On a hiking site like this one, maps are an essential feature. They provide a visual guide to complement the written descriptions of trails. Every trail presented on Hikemtshasta.com is accompanied by an illustrated trail map. However, it is likely that visitors will acquire one of the maps that have been professionally published and are for sale on Amazon.com, in stores and from the U.S. Forest Service. 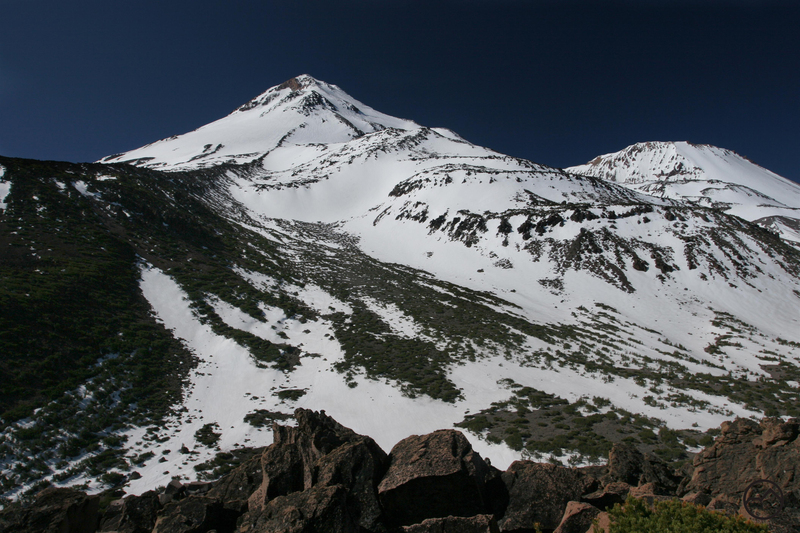 Mount Shasta is an obvious candidate for a good trail map. The trails on the mountain are exceptionally scenic and attract hikers from all over the world. There are, in fact, at least three maps that illustrate the trails on the mountain. Unfortunately, each of the three maps has significant inaccuracies or omits trails that should be documented on the map. Three publishers are responsible for the maps: the Wilderness Press, Thomas Harrison Maps, and the United States Forest Service. Though some of the errors and omissions are the same between the different maps, each one has peculiarities all their own. It is surprising, especially on the map produced by the Forest Service, that these errors were made. The trails on Mount Shasta are generally straight forward. It is not essential to carry a map while hiking on the mountain. Between being well-signed with obvious trails and many of the routes being simple out-and-back affairs, a map is somewhat superfluous. However, it certainly does not hurt to have one and it is helpful to acquaint oneself with the geography. Maps are more helpful while attempting cross-country trips to places like Ash Creek Falls. So, though they are not absolutely necessary, trail maps are useful and it is worthwhile to evaluate what the three Mount Shasta trail maps got right and where they erred. Both the Whitney Falls and North Gate Trails are depicted inaccurately. This is probably the most widely distributed of the Mount Shasta trail maps. This is due, at least in part, to the fact that aside from being generally available in stores by itself, the map is also included with the Wilderness Press’ “Mt. Shasta Book ”, which is considered the definitive book on hiking around and climbing on Mount Shasta. One would think, considering the general quality of products released by this publisher, that this map would be a good resource for exploring Mount Shasta. Unfortunately this is not the case. The Wilderness Press Map is by far the worst of the three maps. One of the biggest complaints is the map’s chaotic appearance. In addition to trails, the map illustrates climbing routes, skiing routes, the circumnavigation route, and roads both paved and unpaved around the periphery of the wilderness. Making matters more complicated, the colors used to indicate the hiking, climbing and skiing routes are all different shades of red. It is very, very cluttered. Exacerbating the problematic appearance further, the map seems to be shaded relief, but the shading is on steroids and follows no discernible metric. Rather than giving the map a three-dimensional look, it just ends up looking splotchy. The appearance, however, is not the biggest problem with this map. The map is riddled with errors when it comes to marking the trails on the mountain. The only trails that are reasonably accurate are the Horse Camp and the Brewer Creek Trails. The Squaw Meadow Trail is acceptable but is only loosely accurate. The other trails, especially the North Gate Trail, are completely inaccurate, following an old routing that has not been used for well over a decade. Trails are also illustrated that do not really exist. When the wilderness was established in 1984, some old roads were truncated and the sections that now fell within the wilderness were officially listed as trails. No maintenance has been done on these in the 30 years since and almost none lead to interesting destinations, yet they appear as trails on the map. This is unnecessarily misleading. Between the various trail inaccuracies and the chaotic look, this trail is practically worthless to a hiker, other than to give the broadest of impressions as to where things are at. The only piece of useful information on the map is the approximate location of the circumnavigation route around the mountain. Note the great depiction of the trails along the Everitt Memorial Highway. This is by far the best map illustrating Mount Shasta’s trails that is generally available. 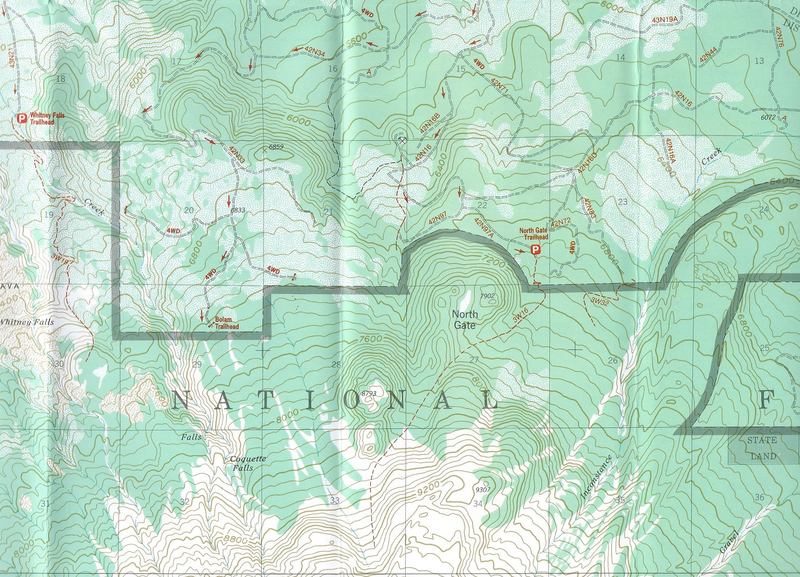 As with all Tom Harrison Maps, the map resembles the USGS Topo maps and has a clean, understated look that still retains a tremendous amount of information. Doing away with the skiing routes present on the previous map, this edition only documents the hiking and climbing routes. The latter is indicated by understated lines of black dots. The trails are denoted with red dashes. Again, as with all Tom Harrison maps, mileage is indicated between points, providing some very helpful data. Another great feature of this map is the generally accurate representation of the trails. One gets the feeling that someone from the cartographers actually went out and hiked many of the trails in order to ensure the map’s accuracy. Quite notably, all the trails beginning on Everitt Memorial Highway (the only paved road climbing Mount Shasta and the most heavily used part of the mountain) are quite accurate. This includes the Old Ski Bowl Trail, which consists of a rather confusing network of old roads that once serviced the now vanished Ski Park. Alone among the three maps, the Tom Harrison edition accurately depicts the new route of the North Gate Trail. The map is also a convenient size when open (far more convenient than the other two maps), folds up nicely for the pocket, and is printed on waterproof plastic. The biggest drawbacks for this map are some minor inaccuracies on the Clear Creek Trail (switchbacks in the trail’s first mile omitted) and the Gray Butte Trail (map shows the trail ending at communication towers rather than the butte’s summit). Also, while the other maps depict the Whitney Falls Trail inaccurately, this map omits it completely. This may due to the fact that the Forest Service no longer maintains the route. 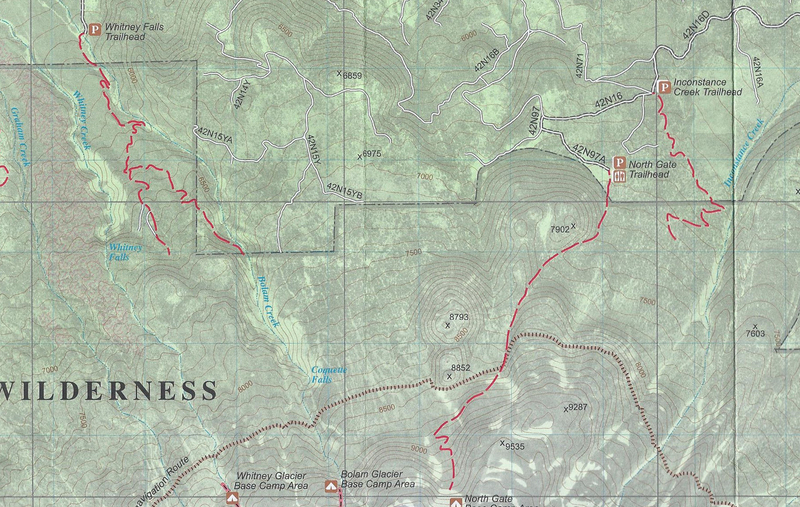 Washed out and lacking shaded relief, this map once again depicts the Whitney Falls and North Gate Trails incorrectly. The Forest Service produces a series of trails-illustrated maps for all of the wilderness areas within a national forest. They are usually printed on waterproof plastic and are generally accurate. One of the biggest drawbacks is their invariably large size (the Trinity Alps Wilderness map is ridiculous; it is essentially a waterproof tablecloth!) 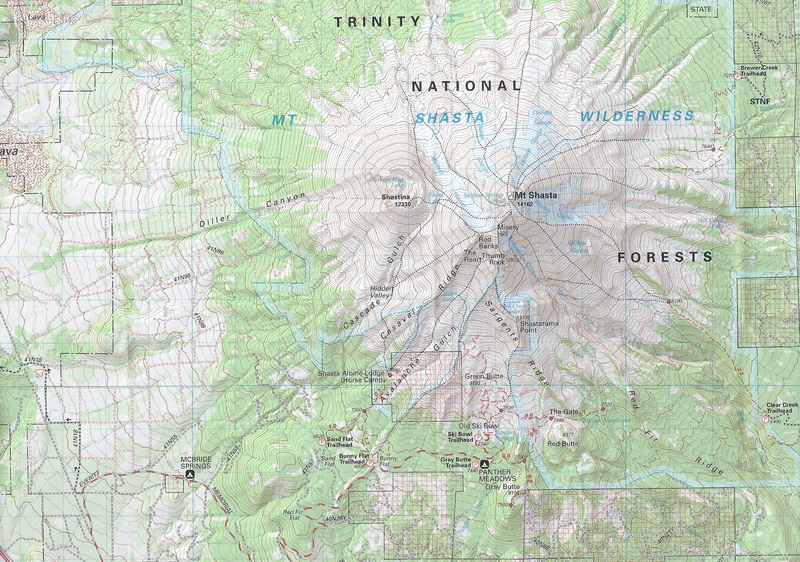 and the Mount Shasta Wilderness map is no exception. By far the largest map of the three, its size unfortunately does not mean that there is more detail. In fact, this is the least detailed map of the three, mostly because it is strictly topographical and has no shaded relief. This gives the map a vague, washed-out appearance. These drawbacks aside, the map is reasonably accurate. It lacks the trail detail of the Tom Harrison map but generally avoids getting things wrong. One notable exception is the North Gate Trail, which, like the Wilderness Press map, shows the trail following its old route up the mountain. Considering that this is produced by the same agency that rerouted and maintains the trail, this is just sloppy. Other errors include very out-of-date condition of the Whitney Falls Trail and the Gray Butte Trail. It does, along of the three maps, accurately depict the switchbacks at the beginning of the Clear Creek Trail. Another drawback is that the map seems to go out of its way to show trails that are not there or are old roads that are now listed as trails but are generally not used by hikers. This just adds confusion and hopefully won’t send an unobservant hiker crashing into the woods to find a trail that is isn’t there. If, by chance a trail was found, it likely wouldn’t take them anywhere. One nice bonus this map does offer is the inclusion of a map of the Castle Crags Wilderness on the reverse side. In the end, the only map that I would recommend folks use for hiking on Mount Shasta is the Tom Harrison edition. The Wilderness Press map is awful and the Forest Service Map, while reasonably accurate (but not more than the Tom Harrison map), is too large and too washed-out looking. If a trip to the hiking trails on Mount Shasta is in the works, it is best to take the Tom Harrison map. Of course, it is worthwhile to reference the map produced by this site to plan your trip. All of the trails were hiked in the summer of 2012 and careful notes were made in order to represent the trails with reasonable accuracy on the maps. 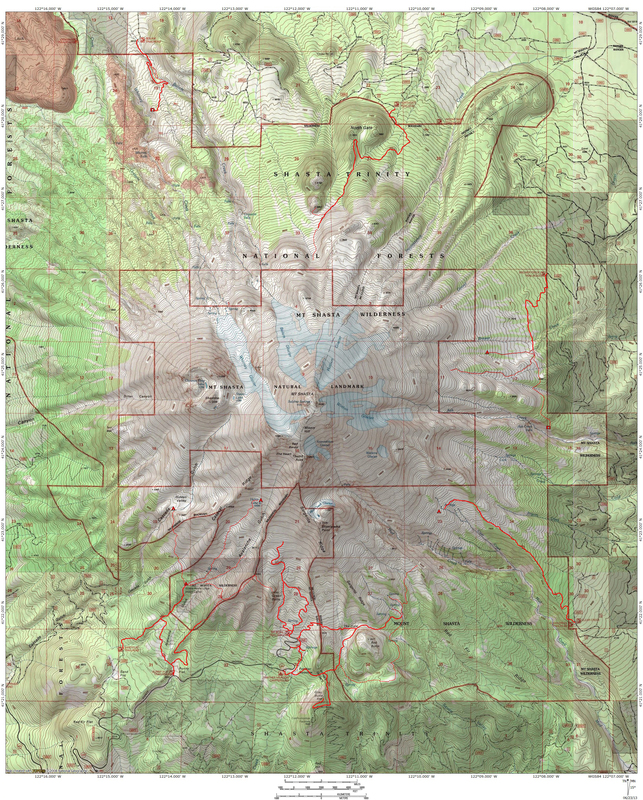 In addition to being significantly more accurate or complete than the three published maps, the Hikemtshasta.com Mount Shasta trail map is also the only one that is comprehensive. It is the only map that shows all the trails in their accurate form as well as unofficial trails and off-trail routes to places like Ash Creek Falls.